This piece was first published on the NYR Daily on October 6, 2016. Every year in China, thousands of people suffer what the United Nations calls “arbitrary detention”: confinement in extra-legal facilities—including former government buildings, hotels, or mental hospitals—which are sometimes known as “black jails.” There is no formal arrest or presentation of charges, and access to lawyers is denied. Many of those detained in this way have criticized the government, complained about abuse, petitioned for remedies, or assisted others in seeking justice (rights lawyers have been especially vulnerable). Others are simply people whom authorities regard as “troublemakers” who might “disturb order” at politically sensitive times such as meetings of the National People’s Congress, anniversaries of the Tiananmen massacre, or last month’s G20 summit in Hangzhou. Until now, there have been few records of what goes on inside these facilities, but one first-hand account has recently come to light. On June 12, 2015, police in Zhengzhou, Henan Province, backed by authorities in Beijing, detained Yang Zhanqing, a veteran public-interest campaigner, and put him into the Zhengzhou No. 3 Detention Center. Yang was well known in Zhengzhou for his advocacy of the rights of people with chronic medical conditions. He opposed, for example, the illegal practice of firing people if they have HIV or hepatitis. After thirty days at Zhengzhou No. 3 Detention Center, they were released “on bail pending criminal investigation,” meaning they would continue to be monitored by police, were forbidden from leaving their local areas, and could not talk to the press or meet with supporters without advance permission from the police. By law, the status ends after one year if there has been no violation of bail rules or “new criminal activity.” One year has passed for Yang, but so far he has received no notice of any change in status. Yang wrote the following text during his detention. 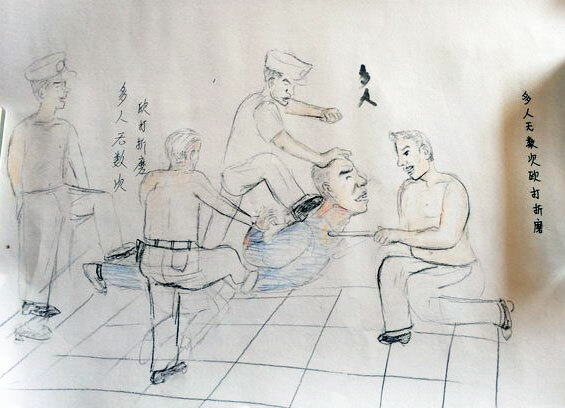 A sketch by truck driver Liu Renwang, showing abuse he received in an extralegal detention center, 2014-2015. Nobody has posted any money deposits for you people, so you can’t buy toilet paper. So how do you wipe yourselves? We live in a green society now, so you just use your hands and then rinse with water. Be sure to rinse well, too—because if you don’t, other detainees aren’t going to like it next time you pass a steamed bun to them. The few who do have toilet paper, whether by purchase or from stealing, are forbidden from sharing it. The punishment for anyone caught sharing toilet paper is that the paper is confiscated and future possession is banned. The line in my poem about buns refers to another policy at the Center: detainees eat by hand. We are ordered to squat in rows and to pass steamed buns down a line. In addition to the buns, we are given bowls of soupy dishes containing chunks of turnip and cabbage. But we are given no spoons or chopsticks, so when we are finished drinking the soup we have only our hands for getting the chunks of vegetable into our mouths. By the end of a meal everyone’s hands are wet. A few do have spoons, purchased from funds on deposit, but another rule prohibits the lending of spoons. The Center’s policies are worth analyzing. What would be the reason for withholding toilet paper and spoons? Why stipulate that sharing and lending are prohibited? Primo Levi, writing about his survival of the Holocaust in The Drowned and the Saved, describes riding in a boxcar that was headed for the death camps at Auschwitz in February 1944. The passengers were given nothing, not even water or toilets. Extreme thirst, Levi writes, was far worse than the cold. Having to relieve oneself in public was cruelly humiliating. Lacking utensils, people had to eat as animals do. In a chapter called “Useless Violence,” Levi asks why the Nazi regime designed such conditions. Was the punishment really useless? One might call it “gratuitous,” but it was not, I think, useless. The purpose was to grind people down to a semi-human condition and mentality. It is the same at our Center, whose regimen can be explained only as an intentional reduction of people to animals, without dignity and without shame. The word “torture” comes from the Latin torquere “to twist,” and our Center has its repertoire of twisting techniques. People are forced to choose between the humiliation of washing their anuses by hand in public and committing the even greater “crime” of stealing toilet paper, between eating cooked turnip by hand or committing the offense of borrowing a spoon. Aside from these standard devices, the principle “degrade as necessary” is available to the guards for use however they may see fit. A few days ago I saw a female detainee going through check-in. She was surrounded by four or five policewomen who demanded that she unbutton her blouse and undo her bra. This exposed her naked breasts to full view in a public area. The police barked at her when they found a few pieces of toilet paper hidden in her bra. The chief warden’s sermons depict everything as the detainee’s fault: “You don’t have any money, but you still insist on shitting….” The authorities strip you, piece by piece, of the layers of civilization that clothe you. You, who had walked on two legs, now begin to bend, to prostrate yourself, to crawl. Are these gratuitous humiliations really “useless”? Hardly. The goal is to break a person’s will, because a person of broken will is easier to manipulate, and our Center is therefore easier to run. And there is an added benefit: the wardens are, after all, human beings, born with consciences, and it can be psychologically stressful for them to have to “twist” other human beings. But if the others are less than human beings? Only semi-human? It is easier. A question remains: What can an inmate do to defend against the humiliation? Perhaps people who have already been reduced to a semi-bestial condition suffer least in detention centers. Not long ago the Chinese media carried a story about a destitute old man who committed theft in broad daylight so that he would be detained; for him, boiled turnips and humiliation were better than nothing at all. But his is an unusual case. Liu Renwang, a truck driver from Lüliang city in Shanxi province, spent five years in prison before his conviction was overturned. After his release, he showed friends some vivid sketches that he had made in prison, of scenes of “extracting confession by torture.” It was his own torture that he was sketching. Is it possible that, while undergoing the torture, he was imagining himself as merely collecting cartoon material? Perhaps to be used some day to win six million yuan in damages from the authorities? Such thoughts might at least have helped block out the unbearable thought that what was happening to him was useful to someone. For most detainees, psychological defense mechanisms can be useful. Fantasy, for example. When given no alternative but to defecate in full public view, you can fantasize that you are a peacock, flaunting your tail, basking in the admiring gaze of others. This may not bring happiness, but it helps to mute humiliation.